What Kind of Fish Eat Pond Algae? Algae have the potential to turn any garden pond into a suffocating, ugly eyesore. Some types of fish, however, eat pond algae. These fish are usually bottom-feeders. The best place to find information on species that fit your needs and region is your local fish provider, pet store, or hatchery. These sources can provide information about space requirements, habitats and climate. One natural way of controlling unwanted growth in your pond is with fish that eat pond algae. Catfish are one of the most well-known and appreciated algae eaters in ponds, rivers, and tributaries throughout many regions. The catfish comes in a variety of species. The most identifiable characteristic is the long whisker-like tendrils that extend from its front facial area. The catfish is an efficient algae eater and tends to avoid other fish. Occasionally, however, this species may tend to be a bit aggressive. When algae run low, some catfish, namely channel catfish, will look to prey on smaller species. 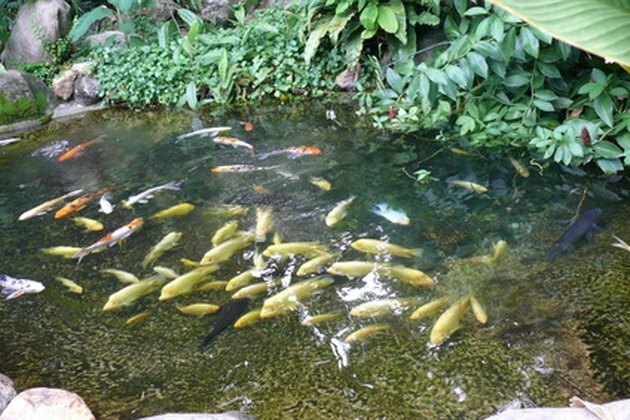 Goldfish are a favorite in smaller fish ponds. Their attractive scale color, pleasant expression, and easy maintenance, make this an ideal species for most any pond. They accent garden ponds and Asian-style ponds while helping in their maintenance. This fish is a relative of the carp. Goldfish tend to be cheaper than their close relative koi, but tend to bring disease. It is possible for one fish to spread disease and wipe out an entire population. This fish is hardy and accommodating for most any small pond. Some refer to the koi as a colorful carp. If your fish pond is larger, be wary of birds, namely the great blue heron. That species loves to feed on koi, and once your pond is discovered as a meal provider, you will have this additional challenge. This algae eater will add color to your pond as koi tend to sport white and orange, while goldfish are all golden orange and carp are plain gray. Tadpoles and shrimp also are algae eaters. Tadpoles are amphibians and algae, in addition to insect larvae, are one of their most basic food sources. The best places to go for your fish are fish hatcheries, pet stores, and fish stores. Stores are more readily available in urban areas while hatcheries are near state parks and more rural locations. James G. Pradke began writing freelance in 2010 and currently authors the "Clarion Post." Areas of particular expertise include education, small business, arts, international travel, and home and garden. Pradke possesses a Master of Arts in international peace and conflict resolution from American Military University.